KYIV, Ukraine—On Wednesday, a powerful thunderstorm rocked Ukraine’s capital city with lighting, thunder, and torrential rains. By early evening, the clouds had parted. But another storm, which has been brewing for more than three years, still loomed over the embattled, post-Soviet country. It is the Ukrainian people’s disappointment with what many consider to be the failed promise of the 2014 revolution, as well as a crisis in confidence among Ukrainians for their elected officials and government institutions. “The Maidan is still ongoing, and it requires a lot of efforts from all pro-European political forces for it to succeed,” Alex Ryabchyn, a Ukrainian member of parliament, told The Daily Signal, referring to Ukraine’s central square, the Maidan, which has become colloquially synonymous with the 2014 revolution. Clues to the gathering storm clouds of discontent in Ukraine are subtle, but prolific. One piece of evidence is the facade of Emporium, a high-end furniture store in central Kyiv. Emporium is on European Square—just a few blocks away from the Maidan. On this day, the store’s windows are smashed in. The stone facade is covered in vulgar graffiti. On Sept. 3, the store’s owners painted over graffiti images of prominent Ukrainians—images that had remained on the storefront since the revolution, more than three and a half years ago. The adjoining intersection of Petrivs’ka Alley and Mykhaila Hrushevskoho Street is where some of the most lethal violence occurred during the 2014 revolution. Painted body outlines still mark the sidewalk were protesters died more than three years ago. The reaction to the removal of the graffiti portraits at Emporium was swift, and violent. Pictures of a man painting over the portraits went viral on social media. Many of the associated comments accused the store’s owners of being secret Russian sympathizers, or worse, Russian agents. An angry mob soon gathered in front of Emporium, and the store was, in short order, trashed. Graffiti at the Emporium storefront. 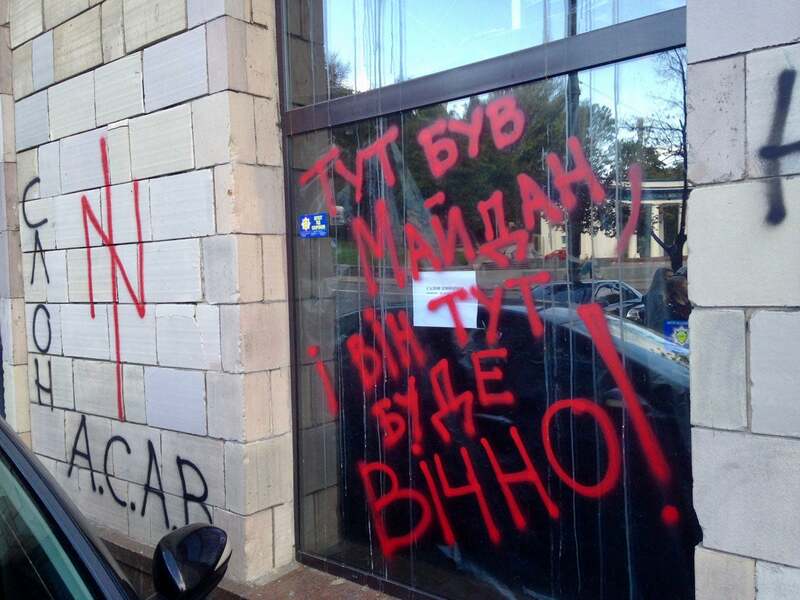 “The Maidan was here, and it will be here forever,” the message in red paint reads. “Never do this again” one spray-painted message on the storefront read. “Profiteer, give us back our history,” said another. “The Maidan was here, and it will be here forever,” another spray-painted message said, referring to the colloquial name for the 2014 revolution. 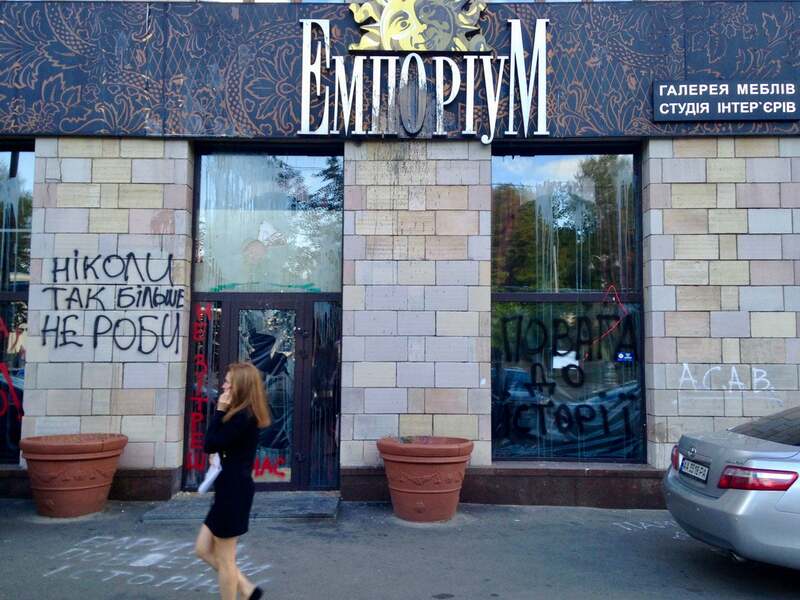 Some say what happened to the Emporium store is more than simple hooliganism—it’s evidence of Ukrainians’ simmering discontent with post-revolution reforms, and their frustration that expected living standard improvements never materialized. According to a November 2016 survey of Ukrainian citizens by the Kyiv-based Sofiya Social Research Center, 80 percent of respondents said life in Ukraine has gotten worse since the 2014 revolution. “The worrying signals are that people have stopped discussing the [political] situation, and it either accumulates into negative emotions or splashes over like it did at Emporium,” Ryabchyn, the Ukrainian member of parliament, told The Daily Signal. For more than three years, the Ukrainian people have been waiting for peace, prosperity, and evidence that better days lie ahead. Yet, more than three years after the 2014 revolution, Ukraine is still stuck in economic doldrums, and corruption is still rampant. According to various polls, Ukrainians’ most worrying concerns are the rising prices of consumer goods and utilities, the war, and corruption. According a June 2017 poll by the Sofiya Social Research Center, 72 percent of Ukrainians think the country is headed in the wrong direction. Distrust for Ukraine’s government institutions is also high across the board. Ukrainian President Petro Poroshenko’s approval ratings consistently linger around 10 percent. According to the Sofiya Social Research Center’s June poll, 89.4 percent of respondents did not trust Ukraine’s parliament, 86.3 percent did not trust the Cabinet of Ministers, and 86.2 percent did not trust the National Bank of Ukraine. Law enforcement agencies also inspired scant public trust. Only 5.9 percent of respondents trusted the courts, and 23.3 percent trusted the police. “Those politicians who will be able to persuade people that they will stop the corruption and thus restore justice might have a better political future,” Ryabchyn said. Disappointment in the revolution’s outcome has been brewing for years. Some say Ukrainians’ faith in pursuing change through democratic processes is being tested. Others contend, however, that Ukrainians will, for now, stick to the democratic process to see the changes for which they hope. “There is no third Maidan immediately on the horizon and, at least in the near term, Ukraine is a politically stable nation,” the American Foreign Policy Council think tank wrote in a recent report, detailing its findings from a delegation visit to Ukraine in June. Some Ukrainian officials say the news isn’t all bad and that Ukraine has turned a corner in multiple ways. But what progress has been made can still easily be reversed. There is good news for Ukraine. For one, the country’s economy appears to be on the mend. Ukraine’s gross domestic product has marked consecutive growth over the past six quarters, and it’s anticipated to grow by about 3.5 percent in 2018, and by 4 percent in 2019. 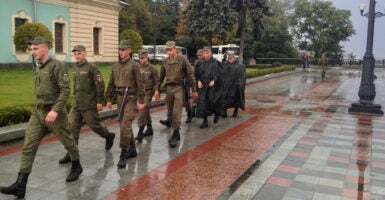 Ukrainian police and National Guard troops remained on guard in front of Ukraine’s parliament building as the storm clouds parted on Wednesday. The GDP growth projections are a good signal, but Ukraine’s economy still has a long way to go to recover from the hit it took from the combined effects of the 2014 revolution, and Russia’s subsequent seizure of Crimea and ongoing proxy war in the Donbas. Ukraine’s gross domestic product topped out at $183 billion in 2013—the year before the revolution and war. It dropped by about half the next year. By 2017, Ukraine’s GDP had recovered to $95.3 billion, according to International Monetary Fund data, and by 2018 Ukraine’s GDP is expected to surpass $100 billion. Still, with an average monthly salary of around $270, about 60 percent of Ukrainians live in poverty. Additionally, the Ukrainian hryvnia, the country’s currency, lost 60 percent of its value after the revolution. Inflation peaked at about 43 percent in 2015, but has settled to around 5 percent. The net effect of currency devaluation and runaway inflation is that most Ukrainians can hardly afford to buy what they could before the revolution. All the trendy new restaurants and coffee shops sprouting up around Kyiv are misleading. For many Ukrainians, times have been tough since 2014, and they likely will remain so for a long time. Still, several years of consistent, if measured, GDP growth have some officials optimistic about Ukraine’s economic outlook. “Having suffered an extremely powerful blow as a result of the war, Russia’s aggressive closure of our largest market until recently, and even the Russian blockade of our exports to third countries, not only have we survived and avoided default … we have laid the foundation for sustainable development,” Poroshenko, Ukraine’s president, said in a statement posted to his administration’s website. Poroshenko has scored some high-profile wins for the Ukrainian people since 2014, including a visa-free travel arrangement for Ukrainians in the European Union, and a miraculous rebuilding of the country’s armed forces while simultaneously fighting a war. Ukraine’s post-revolutionary government has made notable progress in some other key areas—such as waning Ukraine off its dependence on Russian natural gas, a free trade agreement with the European Union, and reforms that have made Ukraine more appealing to foreign investment. “Today we are seeing first signs of return of investors’ interest to Ukraine,” Andy Hunder, president of the American Chamber of Commerce in Ukraine, told The Daily Signal. As proof of Ukraine’s renewed appeal to foreign investment, Hunder pointed to a study published in the global finance magazine Institutional Investor in August. The magazine surveyed 214 international fund managers—from 154 different investment companies—who were looking to invest in Europe, Africa, or the Middle East. Ukraine was their top choice. 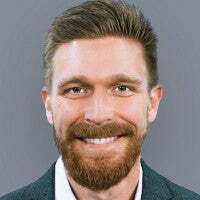 “The interest is a turnaround from three years ago,” the Institutional Investor report said. “However, lots of challenges still exist,” Hunder added. An old lady prays in a park just opposite the front of Ukraine’s parliament building. According to the American Chamber of Commerce’s most recent investment climate survey, corruption was still the top challenge for business in Ukraine, followed by a weak legislative system, political instability, and harassment by law enforcement agencies. Ukraine has also made measurable institutional progress to combat corruption, such as an electronic asset declaration website for Ukrainian officials, and the establishment of the National Anti-Corruption Bureau of Ukraine. Still, many reformers say progress is too slow, and Poroshenko’s critics say he isn’t doing enough to fight corruption. There is a budding populist, opposition movement to Poroshenko’s presidency spearheaded, among others, by former Georgian President Mikheil Saakashvili. But for many Ukrainians, Kyiv’s Byzantine politics are out of sight and mind. Institutional efforts to root out corruption have hardly impacted most Ukrainians’ daily lives. Paying bribes is still the heartbeat of day-to-day life in Ukraine. Whether you want to see a doctor, get a driver’s license, start a business, or pass a university exam—you have to be willing to pony up to get by. According to recent polling, 40 percent of Ukrainians report having made some form of payment or bribe for a public service or to avoid a fine over the past 12 months. And annual GDP growth, while encouraging for foreign investors, doesn’t change the fact that most Ukrainians still can’t afford to buy the things they could before the revolution. Overall, Ukraine’s economy still fundamentally operates in the black market shadows. Ukraine’s “shadow economy”—as the black market economy is called—equates to roughly 35 to 50 percent of the country’s GDP. Moreover, about 30 to 40 percent of taxpaying Ukrainians claim to make the minimum wage—about $120 a month—with the rest likely paid off the books to dodge income taxes. Every step Ukraine has taken forward during the past three and a half years has been in spite of an ongoing war against Russia and its proxies in the country’s embattled southeastern Donbas region. Currently, Ukraine spends roughly 5 percent of its GDP on defense. And, based on manpower, Ukraine now has the second-largest standing army in Europe—second only to Russia’s. After more than three years of conflict, about 70 percent of Ukrainians are willing to accept a political compromise to end Russia’s proxy war in eastern Ukraine, according to a July report by the Ilko Kucheriv Democratic Initiatives Foundation. Yet, in the eastern war zone, tens of thousands of Ukrainian soldiers remain hunkered down in trenches and in cobbled-together front-line forts, weathering daily shelling. After two failed peace deals, Russia’s proxy war in eastern Ukraine has not ended. The war still simmers along a 250-mile-long front line defined by trenches and artillery-razed villages. So far, more than 10,000 Ukrainians have died in the war, and about 1.7 million more have had to flee their homes. On Wednesday evening, the storm clouds briefly parted in Kyiv. In front of the Verkhovna Rada, Ukraine’s parliament, riot police and National Guard troops poked their heads from out behind the plastic tarpaulins hanging over the back of their troop carrier trucks. The plaza in front of parliament and the grounds of nearby Mariyinksy Park had been filled with police and troops clad in riot gear for days. 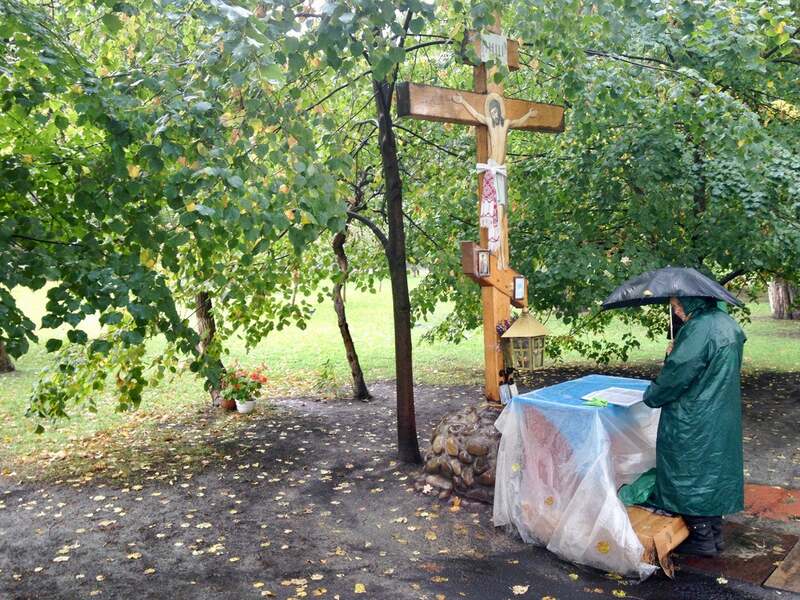 At a small Orthodox shrine in a treeline near the front steps of parliament, an old lady prayed in spite of the rain, as she does every day. About a stone’s throw away, a lone soldier in a drab green poncho stood guard beside a barricade. 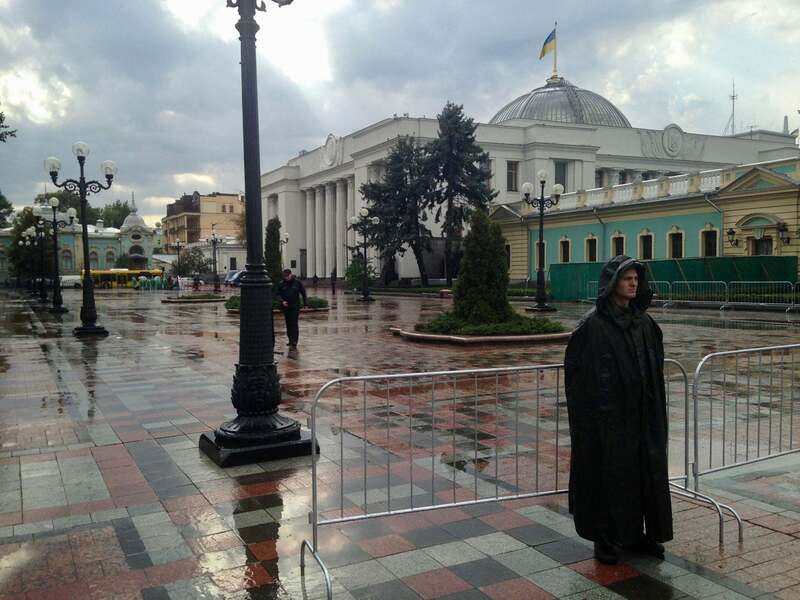 Down on the Maidan, Kyiv’s central square and epicenter of the 2014 revolution, politicians and anti-corruption activists had gathered on this stormy day to call for judicial and electoral reforms. “We have a chance to finish what we started three years ago,” Mustafa Nayyem, a Ukrainian member of parliament and a prominent reformer, who called for Wednesday’s rally, wrote in a Facebook post about the event. As the rain slowed to a drizzle, and the thunder dimmed quieter and quieter into the distance, one wondered if the storm was truly over, or if this was just a brief, deceptive moment of calm.